Sleeping comfortably during pregnancy can be a bit of a challenge, especially during the later stages of pregnancy. One of the most frequently asked questions by pregnant women is, ‘which side should I sleep on? Owing to the bodily changes during pregnancy, some sleeping positions may not be as comfortable as before. Experts generally don’t recommend lying on the back during pregnancy. It is important to bear in mind that it is quite common to have a few uncomfortable nights, as the pregnancy progresses. It is best to give your body suitable time to adjust to a new position. 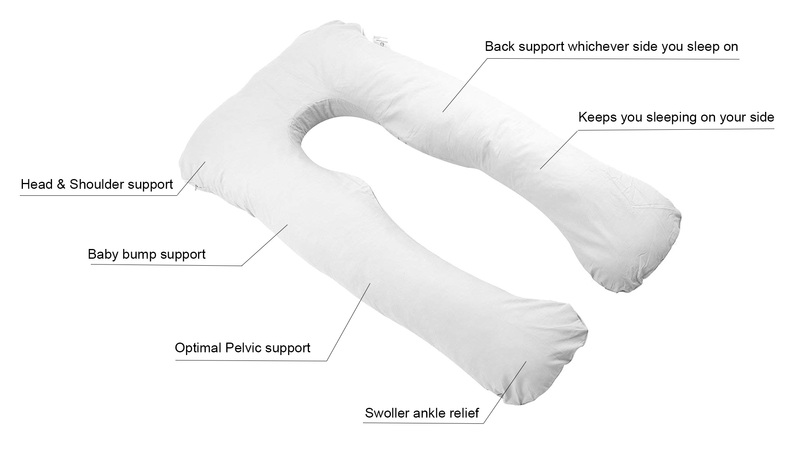 So I suggest you to use our U- shape design pregnancy pillow in your pregnancy days. If you want to have a good sleep, please see the introduction of our pregnant pillow as below. 1) Soft skin-friendly – 100% cotton fabric and premium polyester fibers. 2) Full Body Supporting Design – unique U-shape design follows shape of human body, and is long enough for you to stretch out and support both sides of your body. 3) Versatile – made from hypoallergenic material, which is safe for nursing, reading, watching TV, or just daily relaxing. 4) Deeply Sleep – ideal for sciatica relief, relief of leg swelling and back pain, prevents hypertension syndrome and pressure on the liver, as well as eliminates tossing and turning. 5) Multifunctional usage – suitable for back sleeper, side sleeper and stomach sleeper. Provides you with the perfect balance between comfort and support for your head, back, belly, sides, knees, hip and feet. This entry was posted in Sleeping Tips, Spring Share and tagged hotel bedding supplier, pillow factory, pillow supplier, pregnancy pillow factory, supporting pillow manufacture by admin. Bookmark the permalink.